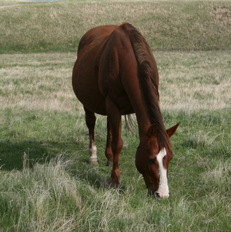 We have over 20 broodmares, and will be adding them all, along with a photo and pedigree, to this page as time allows. 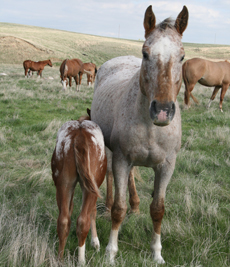 If you have questions regarding one of our broodmares, please call us at (701) 843-7156 or drop us an email. 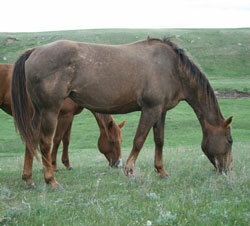 We are keeping our Zippos Country Cat daughters and are therefore selling some of these good mares. It is your chance to get a one or two Secret Admirer foals with a well bred mare at reasonable prices! 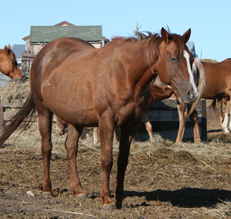 Many of Rocky Top Appaloosas broodmares are bred out of Tim King, Zippos Country Cat, Rockin' Sidney, and Secret Admirer. 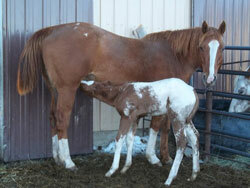 Sells with 2013 foal and bred to the stallion of your choice, or will sell open. See her 2013 foal by Secret Admirer. Look at her pedigree! She is a great mover and produces the same. 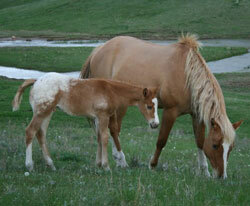 Her 2008 foal was Reserve Champion at the ND 50/50 Futurity, an All Around competition. 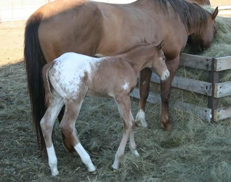 See her 2013 foal by Justa Zippos Dream. 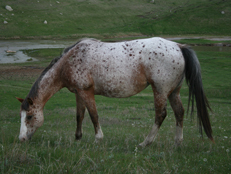 2003 Appaloosa Red Leopard Mare. Exceptional mare that has been producing well for us. She was ridden before we bought her and has a lot athletic talent. Nice daughter of Zippos Country Cat for sale. Matty was open this year, she's broke to ride and has been ridden on wagon trains and trail rides. 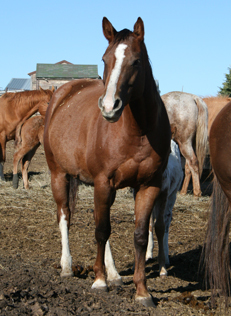 Full sister to Zips Country Eclipse, 2009 Dakota 50/50 Futurity Reserve Champion and 2010 Red River Valley International Select Sire Futurity High Point Performance Horse and Reserve Champion and three other top performance geldings. Beautiful mare, the product of a Rockin' Sydney and Tim King cross. Flashy mare with an awesome disposition. The bloodlines that have produced many performers for us. 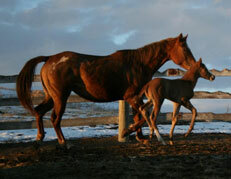 Her foals have excellent disposition and are easy to train. Bred to Secret Admirer for a 2014 foal. Consistantly produces exceptional foals. 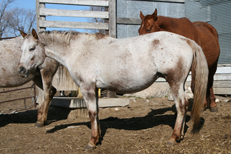 Dam of Genuine Secret, owend and shown by Lisa Feldner, placing in the top five at the Appaloosa Word Show in 2011 and 2012 and earner of many other awards. See our accomplishment page for details. Big powerful mare by Zips Country Cat. She has produced exceptional foals. See Secrets Dun Zippin's accomplishments. 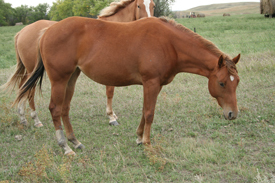 Watch for her 2012 foal, Redneckognized, to be shown in 2013 by Rylan and Abra Sundsbak. She is open for 2013.
shown by Roxanne Dewes. 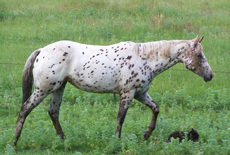 Canadian National Championships in 2012 and International Hi-Point Horse. See our accomplishment page for details. 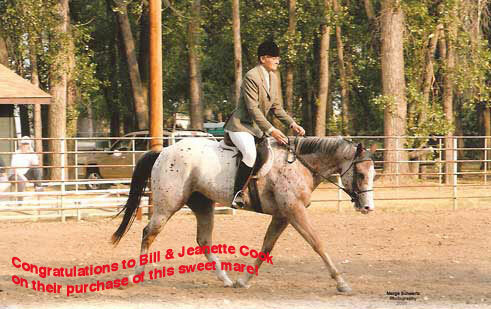 Thank you to Wade Sherwin for purchasing this nice mare!